Dientes Hernández was born Eduardo Hernández Calderón on June 22, 1908 in Huichapán, Hidalgo state. He was an amateur wrestler during 1925 and 1932, and was trained for the pro sport at the Escuela Nacional de Maestros (the second ever lucha training school) by Gil Larrea, who was one of the pioneering maestros of lucha libre, and Satake Nabutaka, a Japanese wrestler who was one of the first men to wrestle in Mexico in the 1910's. Debuted on September 28, 1933 at the old Arena Modelo in what was the second show promoted by EMLL. He wrestled Mario Nuñez to a fifteen minute draw. His payday for that match was 5 pesos. Dientes was a fine, versatile athlete who mastered many disciplines, as his in-ring style showed some touches of jujutsu (jiu-jitsu) mixed with pro and amateur wrestling holds. 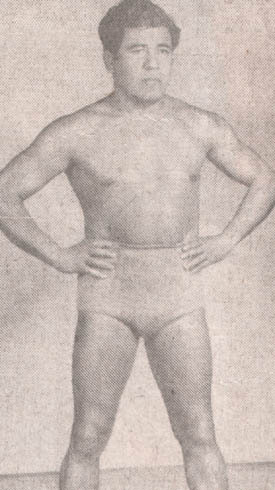 He was one of the first national stars and he gained popularity as a barefoot wrestler during the infant stages of professional wrestling in the country. Hernández captured the National Lightweight title for the first time on June 28, 1937 beating Italo-Mexican wrestler Jack O'Brien. He had already been close to winning that title, as O'Brien himself had won the title in a vacant match against Dientes himself, exactly three years before losing it. Eleven months later O'Brien regained the title, ended up losing it to Bobby Bonales on May of 1940, and now it was Dientes who won it back, that was on September 14, 1940. His run with the title lasted almost two years until he lost it to Adolfo Bonales, brother of Bobby, on July of 1942 to never win it back again. Looking over that title history lineage, one can easily see who were the strongest forces of the division back in the day. On November 9, 1953, he had a 20th Anniversary from his debut show, which was a mixed show where there was matches of diferent disciplines. He was featured in three of them, a jujutsu bout, a greco-roman wrestling bout, and a lucha libre match, where he beat Profesor Avendaño, Chico Veloz and Pedro Bolaños respectively. As a curiosity, the main event for that card was Enrique Llanes and Black Shadow beating El Santo and Cavernario Galindo, and after the matches Dientes had a big party and Manuel Muñoz, who was the president of the Mexico City Box y Lucha commission, gave him a medal. After retiring as a wrestler, he spent some time as a referee and from time to time was featured in exhibitions, for instance against Mishima Ota in bouts billed as "Lucha Japonesa", which actually was jujutsu. Upon leaving the business completely, Hernández became a teacher specializing in mathematics and history. His stay in the business had a considerable impact, as his accomplishments are still frequently hailed in the lucha libre media. This page was last edited on 2 October 2014, at 12:16.